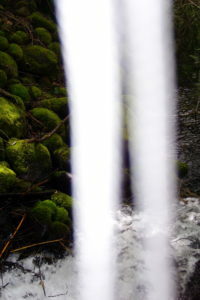 Light Beings Photographed McKenzie River, Eugene, Oregon * Martha Anne St. Claire, M.A. Speaking of light, look at this amazing photo, below! It was taken by yours truly at a brook by the very beautiful Mc Kenzie River, near Eugene, Oregon. The area was dark, in the shade, with no sun rays shining through. The shafts of light look a bit like waterfalls, yet such was not the case.